New car company Lucid has reached 217mph while testing its debut ‘Air’ all-electric model. 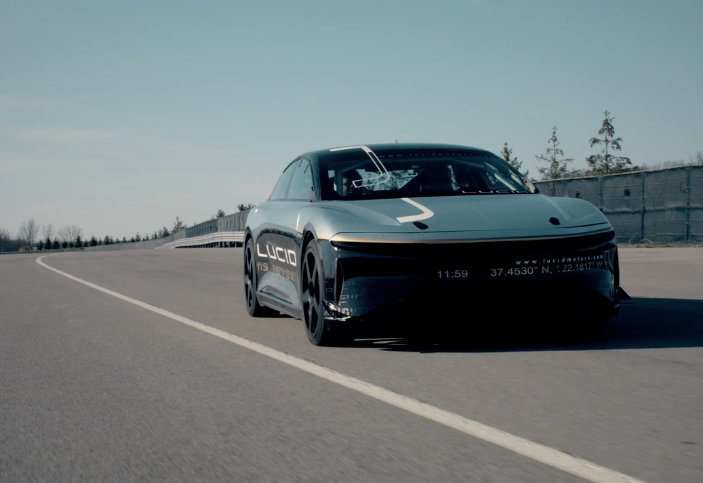 Lucid recently designated one of its prototypes as a high-performance test vehicle and installed a roll-cage for safety purposes. This Alpha Speed Car was used for evaluating 'at-the-limit performance'. The prototype model is being tested in preparation for production in the US, and clocked the impressive top speed as part of the car’s development program. For the Alpha Speed Car’s first test session, Ohio’s 7.5-mile oval test track was used to evaluate high-speed behaviours, including vehicle stability and powertrain thermal management. The test, software-limited to 217mph (350km/h), was successful in demonstrating the capabilities of the car and in finding areas for improvement that could not be properly evaluated in static bench tests. Lucid says real-world tests are an important part of the engineering process, allowing the team to correlate computer simulation models with actual data. The results will now be used to finesse thermal and aero computer simulations and to make further performance improvements that will be tested later this year at higher speeds. The US-based company says, when compared for example, to the Ferrari LaFerrari - even as a hybrid - it has an EPA-certified combined city/highway consumption rating of 14 miles per gallon. Lucid expects the Air to receive a miles per gallon equivalent (MPGe) rating exceeding 100. The testing program continues for the Alpha Speed Car and the rest of the Lucid Air alpha fleet.